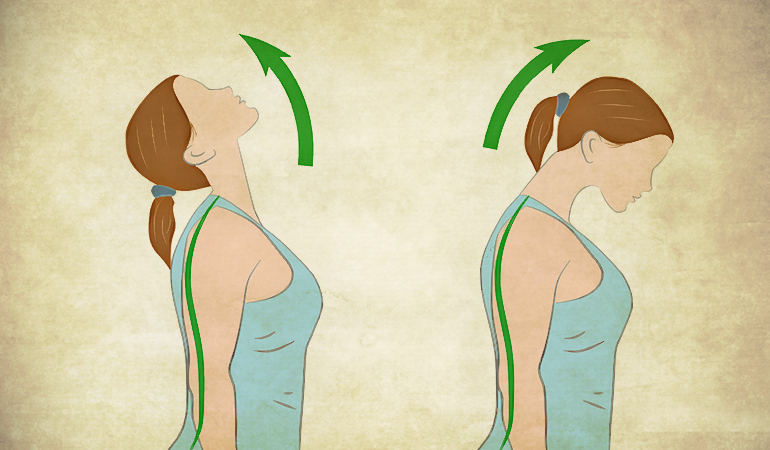 To relieve neck pain without drugs try simple exercises like neck tilts and stretches. 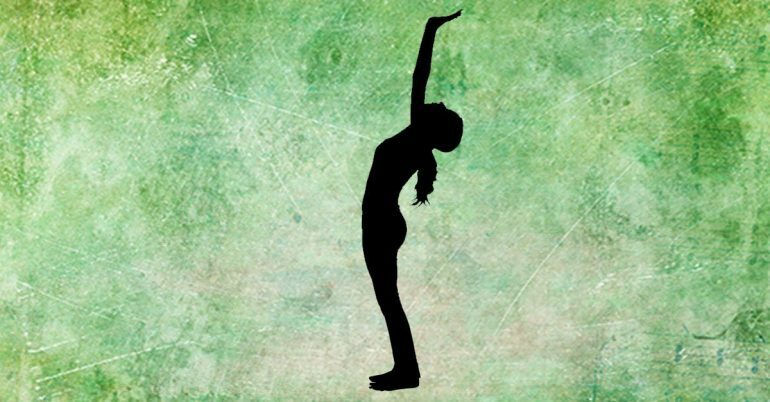 Yoga asanas like the mountain pose, shoulder shrugs, cobra pose, and child’s pose also help. To relieve inflammation or stiffness try a hot or cold compress. A change of pillow or mattress can ease the pain as well. 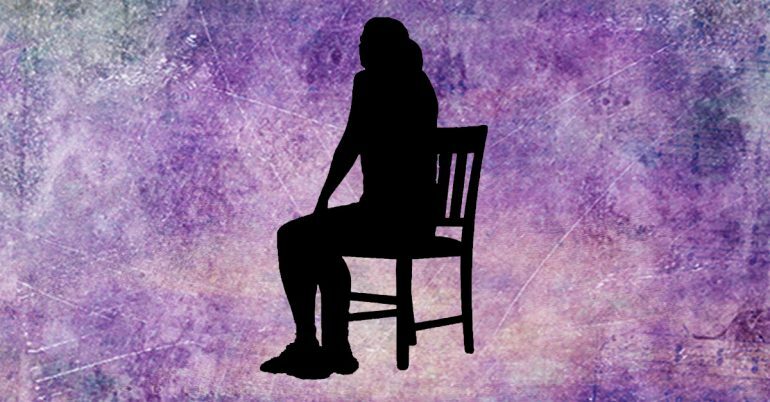 Maintaining the right posture is just as important to prevent future episodes and stop the pain from getting worse. Neck pain can quite literally be a real pain in the neck. It can leave you feeling stiff and uncomfortable and can make moving your head near impossible. If you’re constantly dealing with neck pain as a result of your job, long hours at the computer, or an underlying health problem, here are a few simple exercises and home remedies that might really help. Yoga can also help build strength in the neck muscles (which support the neck and surrounding area), improve their range of motion, and increase their flexibility.2 Here are a few asanas that you can try to reduce the occurrence of neck pain in the future. 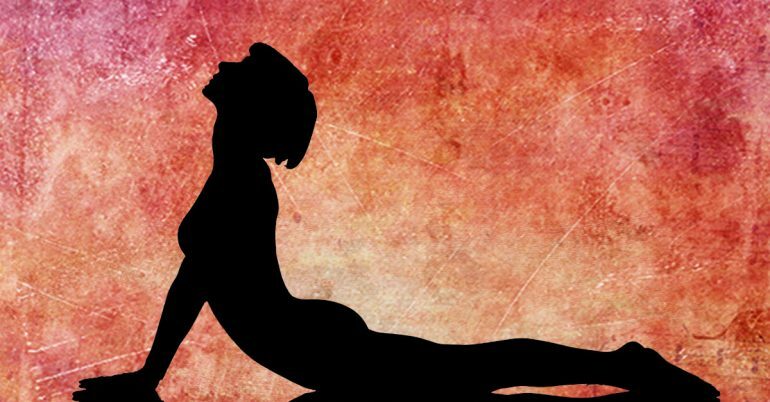 Here’s a detailed reckoner on the best asanas for neck pain relief. If yoga isn’t your thing or you feel that you need the help of an instructor to get going, then these regular stretches and tilts that help neck pain might be less daunting. Studies have concluded that exercise can ease up to 75% of neck pain in many people. This figure is comparable to what you would get out of a visit to a chiropractor.8 9 Here are a few things you can try at home. While keeping your posture upright, push your chin forward so you feel the throat stretch. Gently tense your neck muscles for 5 seconds before returning your head to the center. From this position, push your neck backward while keeping your chin up. Hold this position for 5 seconds. Then, return to the starting position and repeat this stretch 5 times. Tilt your head up and down and then side to side a few times. Be slow and steady with your movement. Gently tense your neck muscles for 5 seconds each time you tilt your head. Repeat this exercise 5 times. Like physical therapy, stretches, and tilts, Pilates can relieve chronic neck pain, improve your posture, and increase the neck’s range of motion. As an added bonus, Pilates also strengthens the neck and upper back muscles.10 Here are a few exercises you can try. 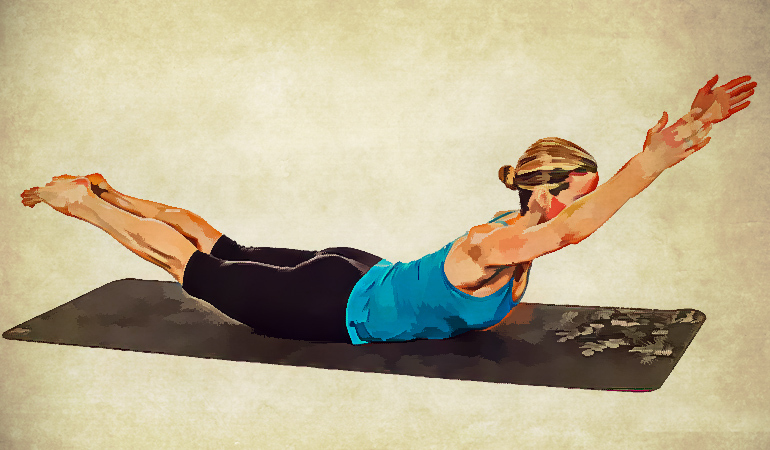 Lie on your back with your legs bent at the knees and feet positioned hip-width apart. Tuck your chin in toward your chest. Slowly lift your head off the mat while keeping your chin tucked. Make sure to keep your head on the floor for as long as possible as you do this, allowing yourself to naturally move into the neck lift. Untuck your chin, lower your head back down to the mat. This is one repetition. 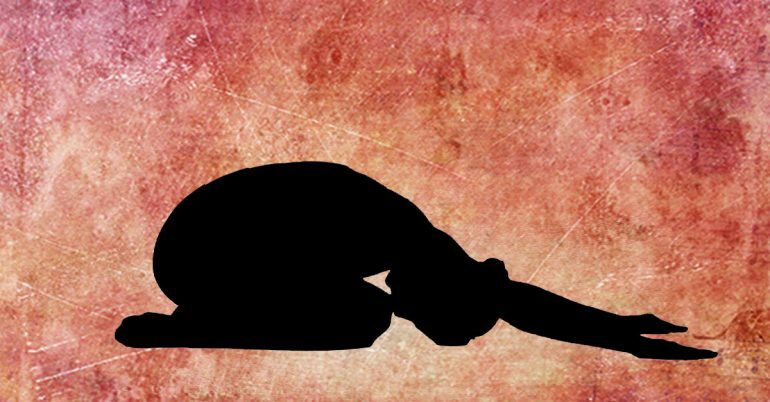 Lie down flat on your stomach and place your hands under your forehead. Lift your head off the mat as you exhale, while keeping your chin tucked in. Inhale as you lower down and relax, returning your forehead to your hands. You could repeat these exercises as many times as manageable. However, be sure to take things slow and not strain your neck. Apply your thumbs to the area between the spine and the shoulder blade. While applying medium-firm pressure, move your thumbs down your muscles along the spine in circular motions. Place both your thumbs on the area between the spine and shoulder blade. Glide your thumbs down your neck and back muscles while applying pressure, following the pathway of the shoulder blade. Applying a hot pack or a cold pack to the point of pain can relieve any pain, ease your discomfort, and decrease stiffness in the neck muscles.13 Here’s how you can go about them. It might be a good idea to exercise the neck gently alongside this remedy to improve the range of motion of your neck muscles. Traditional acupressure practitioners can ease your neck pain and relieve any soreness or stiffness that you might be experiencing. You could either get treated by them or learn how to stimulate the right pressure points from them. Here are a few that you can try. 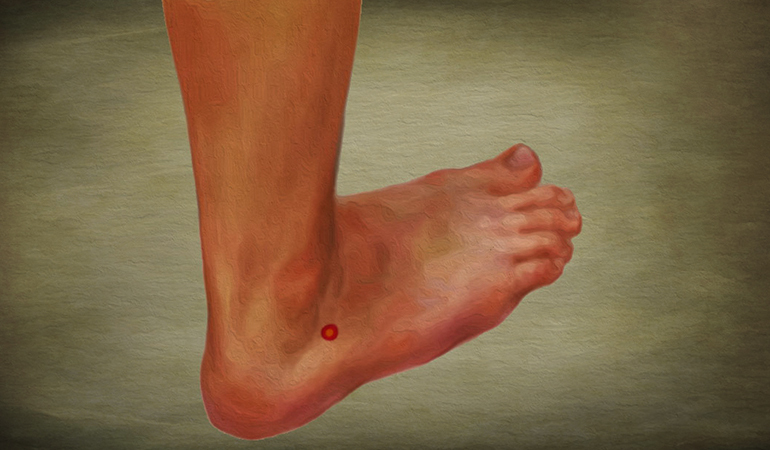 To stimulate any of the above-mentioned pressure points, press them firmly for 4–5 seconds. More often than not, neck pain is caused by wrong posture. 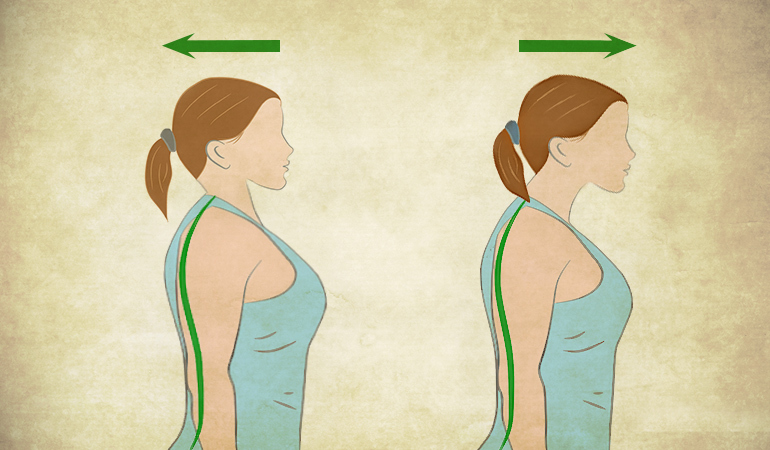 So if you’re already struggling with a bad neck, try and correct your posture to avoid worsening the problem. This should also help prevent future neck pain.24 Even if your neck pain is due to a pinched nerve in the neck, a good posture is helpful. Here are a few pointers to keep in mind so as to sit correctly, whether it is at your desk or just in your living room. Always keep your feet firmly on the ground. If they can’t reach the floor, you could get a footrest. Ensure that your forearms are parallel to the floor. Avoid crossing your legs and make sure to keep your ankles ahead of your knees. Make sure to keep a little gap between the front of the seat and the back of your knees. Ensure that your knees are level with your hips or below them, never higher. Check that your lower and middle back are supported. Add an extra support if you need to. Make sure your shoulders are relaxed. Don’t crane your neck to read from your phone. Hold the phone up to eye level. Don’t cradle the phone between the ear and the shoulder, either. Use a headset. There’s a right way to stand as well and although it isn’t something you think about very often, it is worth keeping a check on. Here are a few things you can keep in mind to maintain a good posture while standing. The bulk of your weight should be carried onto the balls of your feet. If you’ve been standing for a long time, shift your weight from one foot to the other or from your toes to the heels for a bit. Make sure to keep your knees bent a little at all times. Slouching isn’t good for your upper body, but keeping your legs ramrod straight isn’t great either. Ensure that your feet are shoulder-width apart at all times. Make sure to keep your shoulders pulled back and stomach tucked in. Ensure that your head doesn’t jut out to the front, back, or sides and that your earlobes line up with your shoulders. While all of the above-mentioned remedies will help you ease neck pain, be prudent. Go slow with the exercises and yoga poses. Don’t push yourself too hard. Stop if the pain increases. See a doctor if the pain doesn’t go down despite all these measures. 1. ↑ Cramer, Holger, Romy Lauche, Claudia Hohmann, Rainer Lüdtke, Heidemarie Haller, Andreas Michalsen, Jost Langhorst, and Gustav Dobos. “Randomized-controlled trial comparing yoga and home-based exercise for chronic neck pain.” The Clinical journal of pain 29, no. 3 (2013): 216-223. 2. ↑ Plastaras, Christopher T., Seth Schran, Natasha Kim, Susan Sorosky, Deborah Darr, Mary Susan Chen, and Rebecca Lansky. “Complementary and alternative treatment for neck pain: chiropractic, acupuncture, TENS, massage, yoga, Tai Chi, and Feldenkrais.” Physical Medicine and Rehabilitation Clinics of North America 22, no. 3 (2011): 521-537. 3, 4. ↑ Satyanand, Vungarala, T. Gopalakrishnaiah, Elakkiya Panneerselvam, Shaik Mahaboobvali, Shaik Ahammad Basha, and Vanka Sarala. “Effects of yogasanas on cervical spondylosis.” (2015). 6. 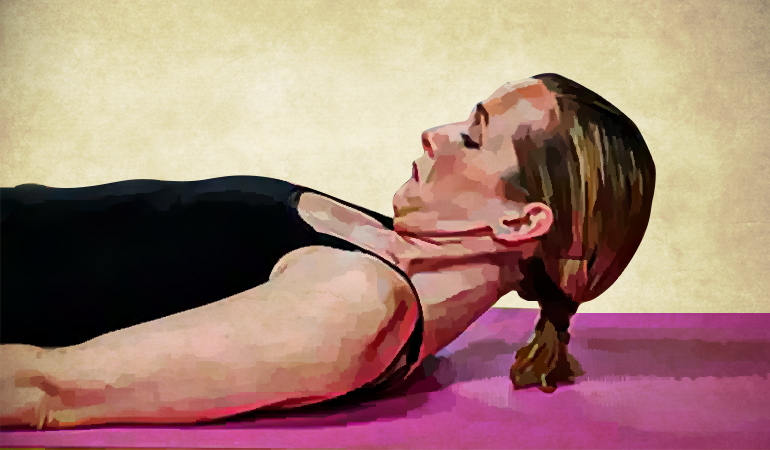 ↑ Yoga for Neck and Shoulder Pain. American Council on Exercise. 7. ↑ Yoga for Neck Pain. Yoga Journal. 8. ↑ What Research Shows About Chiropractic. American Chiropractic Association. 9. ↑ Exercise advice: neck pain. Chartered Society Of Physiotherapy. 10. ↑ Uluğ, Naime, Öznur Tunca Yilmaz, and Murat Kara. “Effects of Pilates and yoga in patients with chronic neck pain: A sonographic study.” Journal of rehabilitation medicine 50, no. 1 (2018): 80-85. 11. ↑ Ou, Ming-Chiu, Yu-Fei Lee, Chih-Ching Li, and Shyi-Kuen Wu. “The effectiveness of essential oils for patients with neck pain: A randomized controlled study.” The Journal of Alternative and Complementary Medicine 20, no. 10 (2014): 771-779. 12. ↑ How To Relieve Neck And Shoulder Pain With Stretches And Massage. Carrington College. 13, 19. ↑ Neck pain. National Health Service. 14. ↑ Epsom salt as a home remedy. Michigan State University. 15, 16. ↑ Ice Packs vs. Warm Compresses For Pain. University of Rochester Medical Center. 17. ↑ [Persson, Liselott. “Neck pain and pillows–A blinded study of the effect of pillows on non-specific neck pain, headache and sleep.” Advances in Physiotherapy 8, no. 3 (2006): 122-127. 18. ↑ Lavin, Robert A., Marco Pappagallo, and Keith V. Kuhlemeier. “Cervical pain: a comparison of three pillows.” Archives of physical medicine and rehabilitation 78, no. 2 (1997): 193-198. 20. ↑ Acupressure Point TE3: Triple Energizer 3 or Zhong Zhu. UCLA Center for East-West Medicine. 21. ↑ Liang, Zhao-Hui, Zhong Di, Shuo Jiang, Shu-Jun Xu, Xiao-Ping Zhu, Wen-Bin Fu, and Ai-Ping Lu. 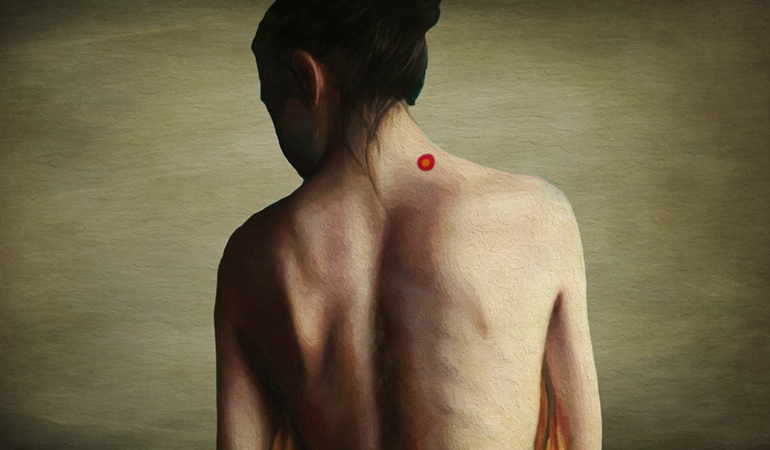 “The optimized acupuncture treatment for neck pain caused by cervical spondylosis: a study protocol of a multicentre randomized controlled trial.” Trials 13, no. 1 (2012): 107. 22. ↑ Jian Zhong Shu. Alberta College of Acupuncture & Traditional Chinese Medicine. 23. ↑ UB-62 (Shen Mai). Alberta College of Acupuncture & Traditional Chinese Medicine. 24. ↑ Tips to Maintain Good Posture. American Chiropractic Association. 25. ↑ Can Dehydration Cause Aches And Pains? Joint Health Magazine.